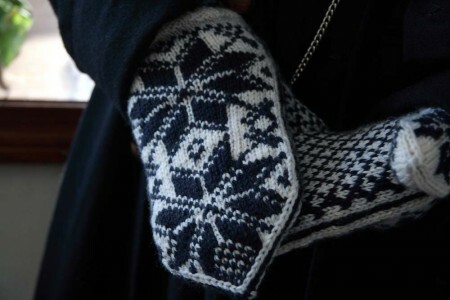 I finished another pair of mittens for NaKniMitMo. These are the Selbuvotter mittens I promised Dale last year when I made a pair for me. Yeah, it took a while. But I’m pretty sure he thinks they were worth waiting for. 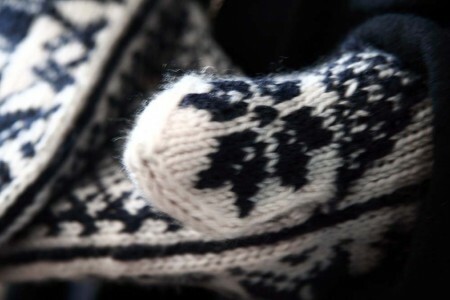 The pattern is NHM #12. I had Dale go through the whole Selbuvotter book and these were the ones he chose. The yarn is Mission Falls 1824 Wool. 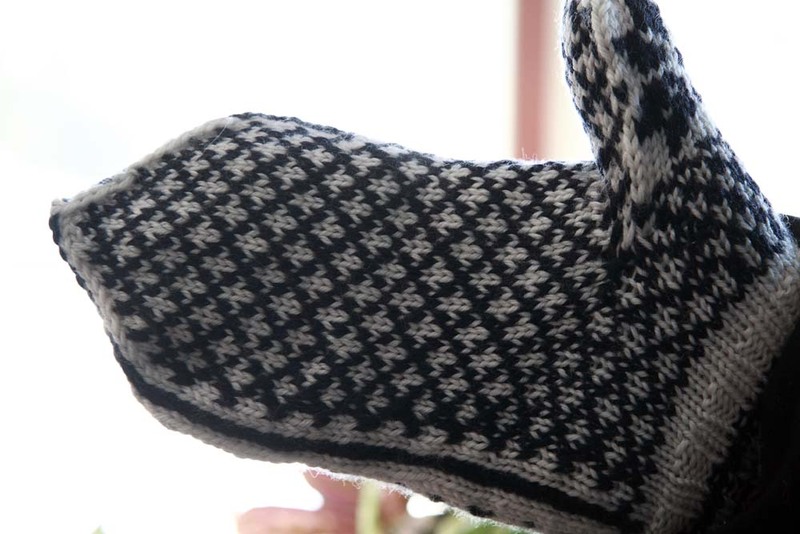 It was nice to work with – soft and smooshy – but it bled a bit when I blocked the mittens. There are a few spots where the white looks a bit blue but I’m probably the only one who really notices it. Still, it was a disappointment and I didn’t expect this yarn to do that. I changed the thumb a bit and knit this star design from a different chart in the book. I just thought it would look better and I’m glad I did it. 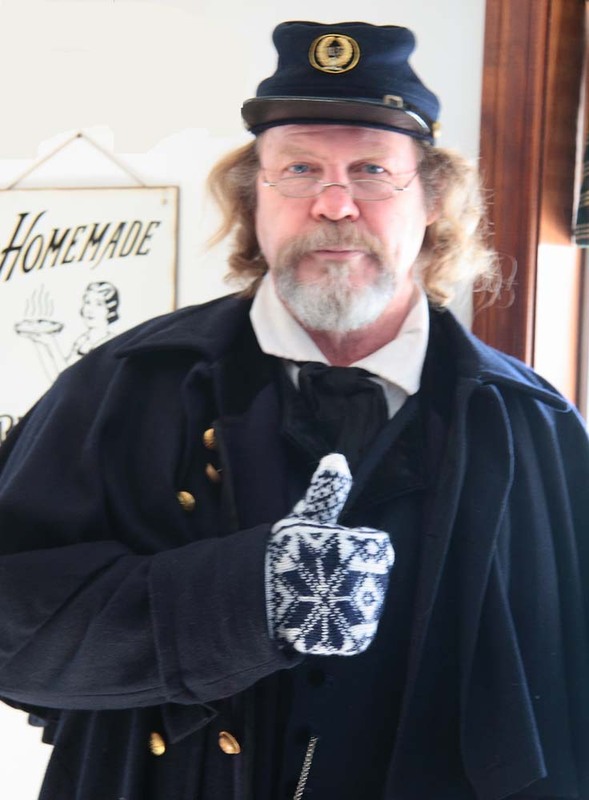 They go great with his Civil War uniform and he wore them to the annual meeting on Saturday. He said he showed them off a bit and everyone was impressed. I couldn’t be more pleased! Great mittens. Very handsome indeed! Magnificent mittens! And the north star design seems ‘specially appropriate for a Union officer. Just do NOT add anything like vinegar to the wash (don’t know if anyone suggested that) because it will make the dye stick where ever it happens to land on the mitts. (not a good plan). They are awesome, indeed. Very manly!